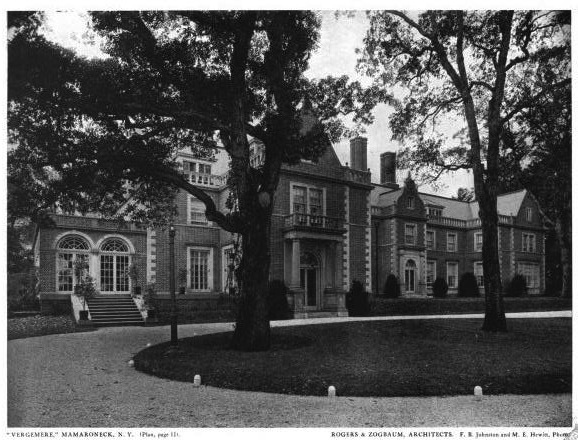 'Vergemere', the Albert C. and Marie Stokes Bostwick estate designed by Rogers & Zogbaum sometime between 1900-1911 in Mamaroneck, New York. Bostwick, who died in 1911, was a noted horse and yachtsman and son of Jabez Bostwick, founding partner of Standard Oil. His widow would go on to remarry the lawyer Fitch Gilbert, a descendant of the founder of Gilbertsville, New York. 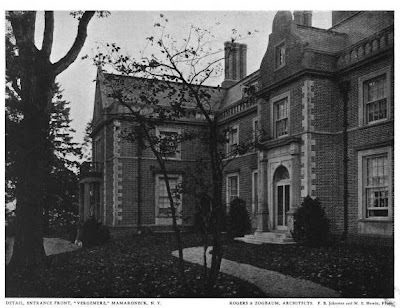 During her marriage to A.C. Bostwick the couple had five children; A.C. Bostwick Jr., Dunbar Bostwick, George (Pete) Bostwick and Lillian Stokes Bostwick Phipps (wife of Ogden Phipps), all of Old Westbury, NY and Dorothy Stokes Bostwick Smith Campbell (wife of Joseph Campbell). 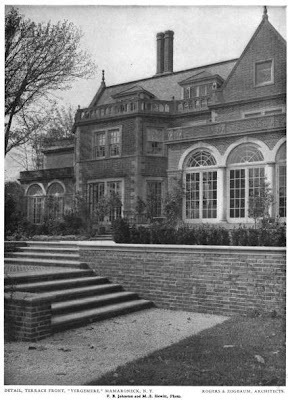 In 1926 the estate became the clubhouse to the Beach Point Club. Click HERE to see 'Vergemere' on google earth and HERE on bing. My, that certainly is a lot of house. 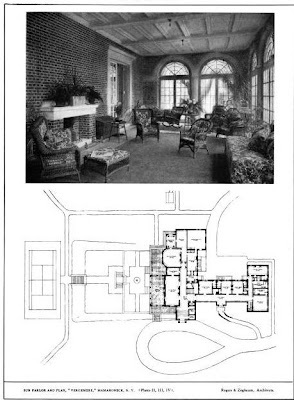 Archi, the need, or desire to add big function rooms, and the many ways in which it is implemented, would fill several posts. There are almost always better ways, less intrusive to the integrity of the original design, that could have been explored, but rarely is that the road taken. And sometimes, even when the organization involved should really know better, there is still someone on the board who can rationalize and sway people into doing it---like the big function room at The Braes, where they really did know better. Yes, but their naval architects, not "architect" architects. They are concentrating on the beauty of ship hulls and keels. The Braes, in Glen Cove, NY is a favorite of mine BTW although it gets alot of grief for looking too "high school" like, it is a wonderful building, has great interior details and has a spectacular setting. BTW.......You got at least an $84 offer yet? Sorry, I'm straying off-topic, another blog, another subject, but too funny to resist. Zach, a lovely estate although I honestly don't know much about it. I'm not surprised that Rogers & Zogbaum were the architects when F. Ambrose Clark used the same for Broad Hollow and a few other projects. The architecture is very grand which honestly which ironically unlike other families was rejected by the family with other homes. Instead a very understated architecture is the norm for Bostwick homes found in Gilbertsville, Aiken, Shelburne, Saratoga, Cooperstown, etc. The Bostwick family still owns chunks of land in the very small yet engaging township of Gilbertsville NY in Southern Otsego Co.
My wife and I actually pondered last month this residence in the town - formerly Pete Bostwick's polo pad - sold to the current owner by Dolly von Stade Bostwick. A lot of house and history for the price.